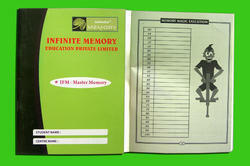 Offering you a complete choice of products which include abacus & memory techniques books. We publish Memory techniques Books. It is a scientific course specially designed for children to enhance their academic performance, memory, creativity, communication skills etc., The benefit of this course is to make the children to face their examination without any fear and stress. It improves their confidence and self-esteem. We make extraordinary Memory Techniques student books for every child to get proper opportunity to get the benefits out of Memory techniques learning. We supply on regular basis so that you run your business for long-term FREE from ROYALTIES and other restrictions. We also offer special feature of supplying these materials with your training centre LOGO and Address printed on the respective material to bring that personalized touch. 6 Months, weekly one class of two hours each (or) two classes of 1 hour each.